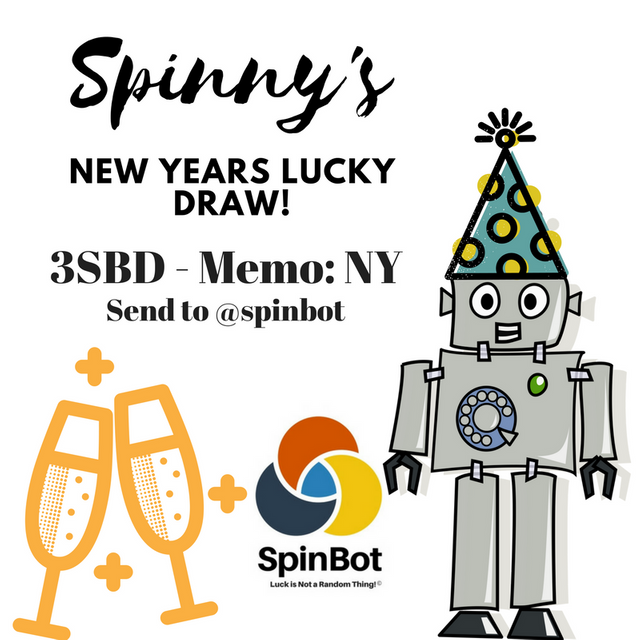 Spinny Presents: The New Years Lucky Draw!!! Do you already love Spinny? Well, Spinny loves all his feeders and this is why he's announcing his first annual New Years Lucky Draw! It's a Lucky Draw (like a raffle ticket game) three lucky winners will receive prizes totaling 60% of all ticket sales!!! What's more, one can buy as many tickets as you would like for only 3SBD per ticket! However, all tickets must be bought seperately. Winners will be announced on Jan. 3rd, 2018! Thank you for your attention and good luck winning the grand prize!!! May your luck win the day! But remember, if you don't win the New Years Lucky Draw, Spinny still loves you and will always think about you when picking posts to upvote! 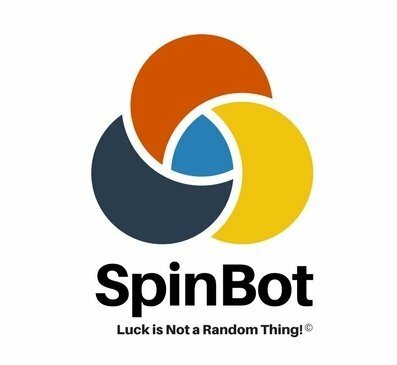 Spinbot owners and employees are not allowed to participate in Lucky Draw activities for obvious reasons. if i send 3SBD, they will be considered as a feed too in my total counting, or only for the ticket? And where we can see the total amount of ticket sold, with all partecipants? ok, so if i write NY as memo, i will buy ticket, if i write any other thing, i feed you. Thanks. Sounds great! What a fun idea!! I've never seen a raffle being held on Steem blockchain before... You guys rock. So let me get this straight, just send 3sbd and memo: NY? Correct. May the best feeder win. Ah, great stuff. I'll have myself a ticket. What are the odds of this raffle? How much do you think I could win? 3 winners will be selected randomly! Each will receive 20pct of the total ticket sales. Good luck friend! vote and comment..and again you vote and comment..
how do you draw the winner? Spinny is a magical creature! Sounds fun! 3 SBD is nothing. Sent already! Sign me up! 3sbd and memo: NY coming in just a sec!!! Pick me for the win! Though I got vote one time from the bot but I just want to keep myself away from those activity or contest totally depends upon luck. "It's a Lucky Draw (like a raffle ticket game) three lucky winners will receive prizes totaling 60% of all ticket sales!!!" Congratulations @spinbot, this post is the third most rewarded post (based on pending payouts) in the last 12 hours written by a User account holder (accounts that hold between 0.1 and 1.0 Mega Vests). The total number of posts by User account holders during this period was 2417 and the total pending payments to posts in this category was $2376.75. To see the full list of highest paid posts across all accounts categories, click here. Congratulations, your post received one of the top 10 most powerful upvotes in the last 12 hours. You received an upvote from @adsactly valued at 51.34 SBD, based on the pending payout at the time the data was extracted. Nyc Post!! I lyk your Post!! I'm almost tempted @spinbot.. it could be a big total ! Whats the grand price or winning price Spinny? Your articles are so great! I just upvoted you and followed you... hope you will post again this much interesting!